For other streams with the same name, see Redwood Creek. Redwood Creek is a 9.5-mile-long (15.3 km) perennial stream located in San Mateo County, California, United States which discharges into South San Francisco Bay. The Port of Redwood City, the largest deepwater port in South San Francisco Bay, is situated on the east bank of Redwood Creek near its mouth, where the creek becomes a natural deepwater channel. The creek and city name, the latter first known as Red Woods City (1854), was named because of the nearby coast redwood (Sequoia sempervirens) forest and lumbering industry. In 1851, a deep-water channel that ran inland to what is now Redwood City was discovered off of San Francisco Bay. Named Redwood Creek, this channel was used by the lumber companies to ship wood and logs from the redwood forests in the peninsula hills to San Francisco. A shipbuilding industry emerged, the first schooner was built in 1851 by G.M. Burnham and appropriately named "Redwood." Wooden shipbuilding remained an active industry until the last wooden ship built in Redwood City, called the "Perseverance," was launched in 1883. The shipbuilding industry experienced a revival in the 1918s with the building of the first concrete ship in America, the SS Faith. Redwood Creek begins in the Woodside Glens neighborhood of Woodside, California just south of Interstate 280, below the terminus of Farm Hill Boulevard. It descends below Interstate 280 on the west side of Woodside Road, passing through the Menlo Country Club. At Alameda de las Pulgas it becomes an engineered concrete channel to El Camino Real, where it is briefly daylighted before entering underground culverts in downtown Redwood City. The primary tributary to Redwood Creek is a stream named Arroyo Ojo de Agua which meets it underground at approximately Broadway Street in Redwood City. As it crosses below US Highway 101 it becomes a tidal channel. Extensive mudflats and marsh areas are found along Redwood Creek near its mouth. Several side channel sloughs connect to Redwood Creek, the largest of which is Westpoint Slough. Redwood Creek and Arroyo Ojo de Agua were fish sampled for Steelhead trout (Oncorhynchus mykiss) in 1981, but no trout were found. The historical status of trout in the creek is unknown. At Stulsaft Park on the Arroyo de Ojo Agua tributary, a population of endangered Fountain Thistle (Cirsium fontinale var. fontinale) was discovered in 2007, and occupies seeps associated with serpentine soils. In Stulsaft Park it is found in an opening in a coffeeberry/bay laurel woodland. The plants may grow 6 feet tall and it is only found in a handful of locations in San Mateo County. ^ a b "Redwood Creek". Geographic Names Information System. United States Geological Survey. 19 January 1981. Retrieved 30 November 2016. ^ "USGS Gage #11482500 on Redwood Creek, Ca". U.S. Geological Survey. Retrieved 1 December 2016. ^ Bright, William (30 November 1998). 1500 California place names their origin and meaning. University of California Press. p. 123. ISBN 978-0-520-21271-8. Retrieved 2012-02-11. ^ "The History of Redwood City". RWC Local History. 2011. Retrieved 14 November 2016. ^ "THREE CONCRETE SHIPS WILL BE CONSTRUCTED AT REDWOOD". The Stanford Daily (9). 12 April 1918. p. 4. Retrieved 3 January 2017. ^ "Arroyo Ojo de Agua". Geographic Names Information System. United States Geological Survey. 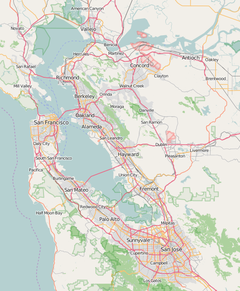 ^ "Redwood Creek Watershed Map". Oakland Museum. Retrieved 2012-02-12. ^ Leidy, Robert A.; Becker, Gordon S.; Harvey, Brett N. (2005). "Historical Distribution and Current Status of Steelhead/Rainbow Trout (Oncorhynchus mykiss) in Streams of the San Francisco Estuary, California" (PDF). Oakland, CA: Center for Ecosystem Management and Restoration. pp. 146–147. Retrieved 7 December 2016. Wikimedia Commons has media related to Redwood Creek (San Mateo County). This page was last edited on 30 November 2018, at 02:23 (UTC).